Let the summer recharge begin! Here on an inland lake in Northern Michigan I have settled for the better part of the summer, taking in big breaths of fresh, clean air and enjoying (mostly) blue skies and warm days. The return to the cottage always brings about a certain amount of work with it and when we arrived for our first visit a couple of weeks ago, I wouldn’t list “relaxing” as a key word. There were screens to put on, porch furniture to haul out, linens to change, cupboards to wipe down (yes, mice seem to prefer inside to outside in the cold Michigan winter), and bags to unpack. There’s also a beach to weed, but that’s part of the never-ending story of summer! But that’s done and now it’s Tuesday, July 4, a very atypical Tuesday! The morning begins with birdsong. Gulls and other lake birds start their chatter early in the day, just after sunrise, and the quacking of the duck family isn’t far behind. As soon as there is action that indicates someone may be getting out of bed, Lizzie-the-Cat adds her own chorus to the music of creatures and her calls are well heeded. For Rick, it’s coffee; for me, Tab. (Yes, people still drink Tab. For breakfast.) Something for breakfast. And then it’s off to our typical July 4. 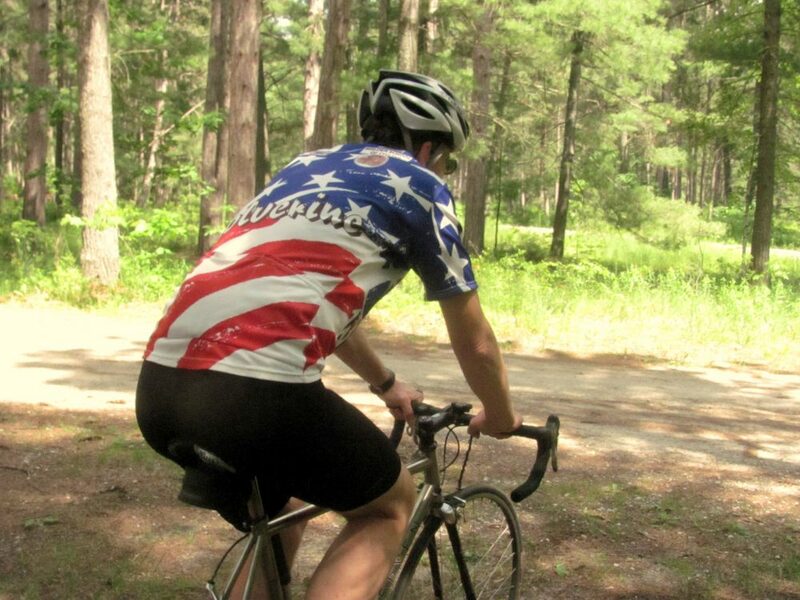 Rick is a cyclist in training for a ride to Quebec City this summer. He’ll be off on a hundred-mile jaunt to a small town about 50 miles from here. Once he’s out the door, I will gather a book — or more likely, my watercolors — and spend some time on the porch “doing my thing” while he does his. I value this period of quiet creativity, listening to the morning ripples on the lake just yards away from where I sit with two jars of water (one for rinsing brushes, the other for mixing), several pans of my favorite paints and more likely than not a blank page, waiting for the first marks. Will it be a landscape? An animal portrait? A whimsical bit from my imagination? Who knows? About an hour or so before he’s due to hit his halfway destination, Central Lake, I’ll pack a picnic for us to enjoy. Thick sandwiches with deli meats, veggies and cheese, a confetti orzo salad with bright bits of red and yellow pepper, radishes, green onions, black olives, fresh herbs, feta and a non-mayo dressing so that we’ll have no worries on food safety. We’ll round it off with chips, big cookies or brownies and cold drinks. Then I’ll hit the road, picnic in hand, camera in my bag (along with a good book, just in case I get there first!). 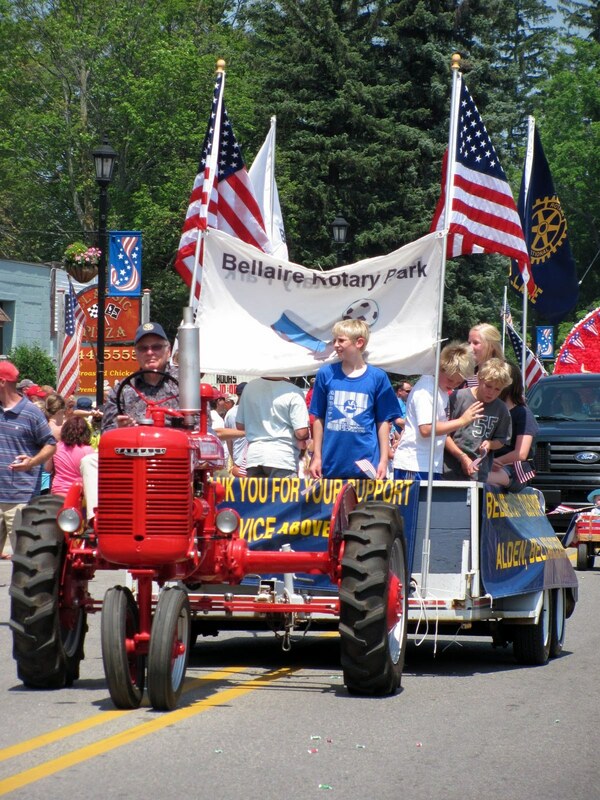 The July 4 parade in Central Lake has become a tradition for us. The town itself is very small, one Main Street and a lake just steps from the four corners. I’m not sure where they find all the people to be in the parade, much less those crowding the streets. And yet the sidewalks are packed and the parade itself is fairly long, reminding me of something I would encounter in a Garrison Keillor story. If one has a dog, a tractor, a truck or is a clown, they are in the parade. Good candy-tossing arms are a requirement! Queens from neighboring communities ride on floats, sweltering in their gowns in the noonday sun and yet waving with cheer. Children from area churches and Sunday Schools ride on the back of flatbed trucks, singing. Every high school band within 30 miles or so is represented, some more tunefully than others, but all with great spirit. 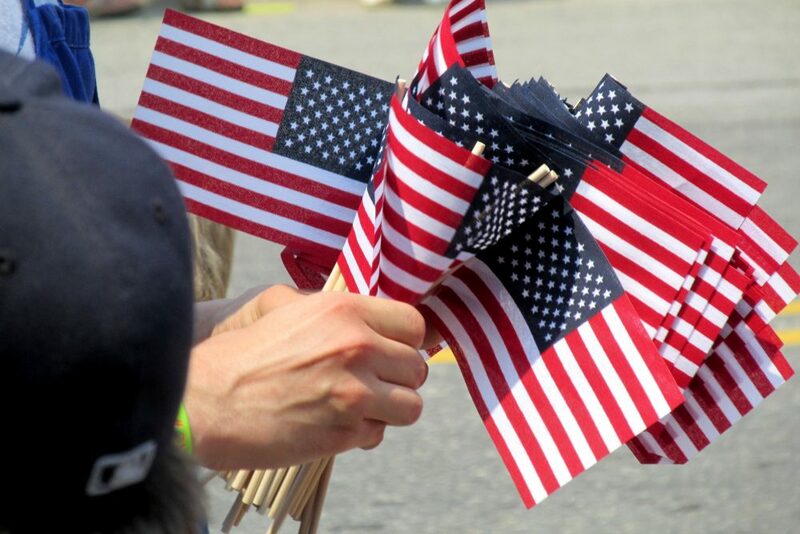 There is red, white and blue everywhere, along with plenty of smiles. As the parade draws to a close, we’ll find a shady spot by the lake for our picnic and when we are satiated, he’ll take off on two wheels. I’ll take off on four and explore antique stores, art galleries and fruit stands on the way home. I will certainly beat him home and in an effort to do something that appears to be productive, I might take another stab at pulling out the weeds from the beach until I’m oh, so very warm! And then I’ll be glad to jump in and swim my “route” between the neighbor’s buoys, making sure to be out of the water by the time the boat parade comes along. The boat parade is a longstanding tradition. 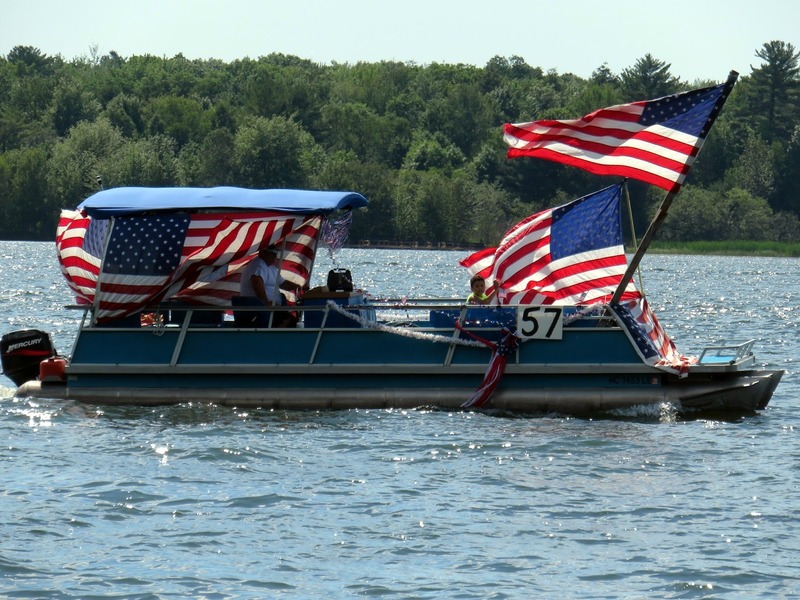 Those with power boats on the lake (and a few intrepid canoe or kayak enthusiasts) deck them out with streamers, balloons and flags and at least begin circling the lake’s shoreline. I say begin, because they do tend to drop off after a bit. Being only about a mile or two from the start line, most are still in place as they pass by. Of course we wave as they honk and shout happy greetings. By now on this atypical Tuesday, Rick has returned and soon it will be time to fire up the grill. It’s definitely a white-wine-night, well chilled and refreshing. If we’re lucky, we’ll have guests for dinner, guests who will stay for the fireworks later in the evening. The lake is at its best as it begins to quiet down. The jet skis have moved on and most are home, enjoying their holiday meal as well. It’s a festive atmosphere. Neighbors are in chat mode, there’s likely to be music. In the air you can smell grills getting a workout — burgers and dogs, chicken and ribs. Summer may have officially started two weeks before, but July 4 seems like the kick-off to a season of refreshment. More likely than not, there will be a spectacular sunset, with the sky taking on various shades of orange and gold and gently edging into cobalt blue. As dusk closes in and stars begin to emerge, so do boats, settling into the waters across from the County Park (and in front of our cottage) to get prime seating for the fireworks display. It doesn’t get fully dark till nearly 10:30 at night at my little spot in Northern Michigan, but the revelers don’t care. And really, why should they? Being out on a lake on a beautiful evening doesn’t require fireworks. It is simply the frosting on the cake. And then that first burst of color. Another, and one after that. 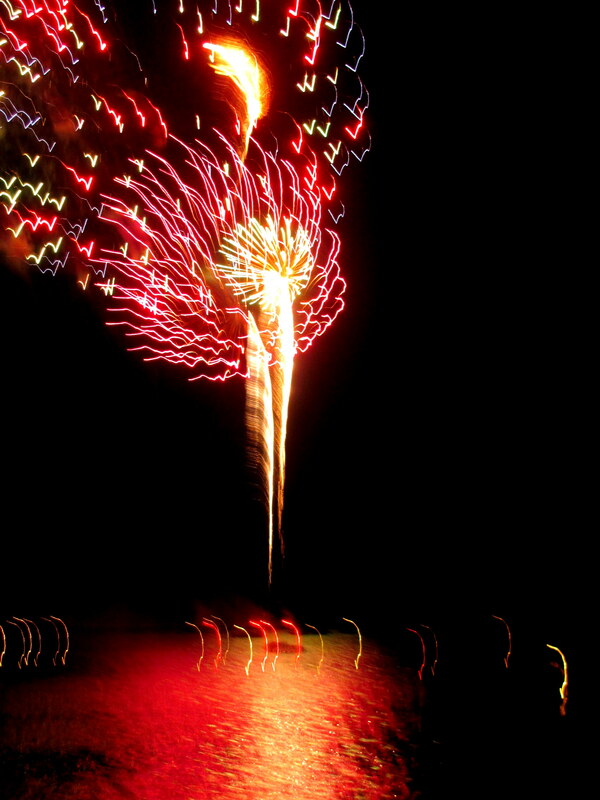 The fireworks will bring to a close this atypical Tuesday, dropping streamers of purple and gold, red and blue into the waters with approving honks from boat horns for a particularly spectacular display. As the grand finale draws the evening to an end, the horns join together in loud appreciation of a day well spent. 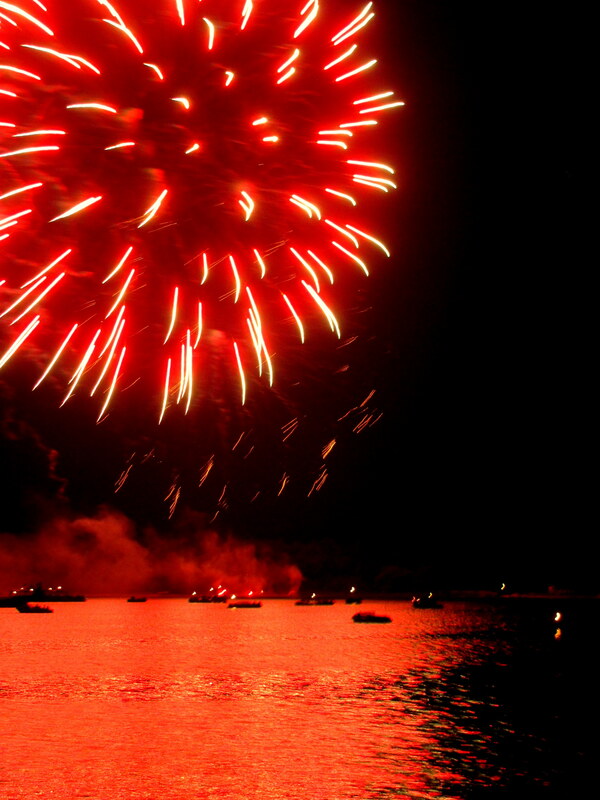 There will be campfires after and more fireworks set off on beaches along the way. Lizzie-the-Cat will hunker down under the quilt that covers our bed, even if the temperature is 80-something and humid, only to emerge when the noise quiets or she is hungry (again) — whichever comes first. As for us, we’ll tumble into bed, smiling and satisfied from a beautiful holiday celebration and eagerly anticipate the next day of art and bicycles, books and swimming, ice cream and a very vocal cat. And if we are wise and honest, we will acknowledge that our atypical Tuesday at the lake really isn’t too different from any Tuesday on vacation — it’s just a little louder and a little more festive. LOVELY! 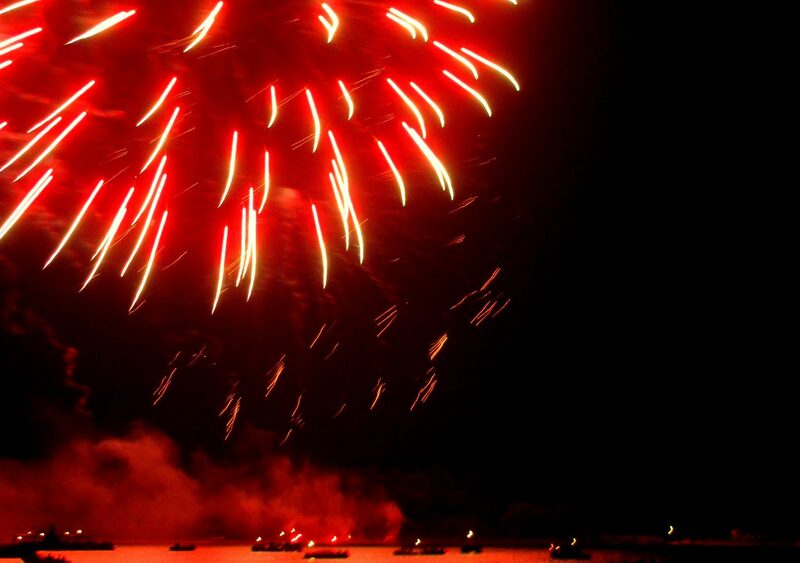 We used to enjoy similar July 4th celebrations at my parent’s lake house in Bella Vista, Arkansas. I hope to someday recreate those wonderful traditions for the next generation. Some traditions deserve to be passed down — and holidays are definitely one! If you decide to recreate those traditions, I know you will! Thanks for stopping by! Your holiday sounds wonderful, except the beach weeding. Like a slice of Americana. Thanks for sharing it with us. I want the cottage next to yours. Wishing you a fun-filled day. Thanks, Jenn! It finally feels like summer! Your a-typical Tuesday sounds perfect for me! I hope you guys had a wonderful holiday. Your picnic sounds delicious and how fun to also take in a local parade! We were at the lake before the 4th and celebrated it early on Saturday with delicious food and a firework show at the end of the night. It was perfection! Thanks, Lisa! The end was a little different from this post (based on all the previous years) but equally good and loads of fun. Lots of the same elements, just different locations! Hello, I did not know you had two blogs. Your place at the lake sounds fantastic even if there is some work involved. 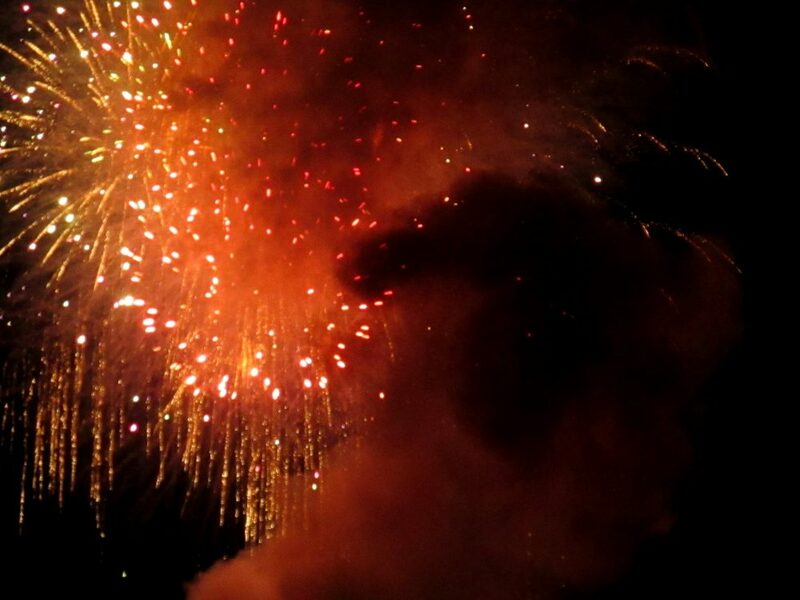 Love the firework images, just beautiful. The boat parade looks like fun. Great post. Enjoy your day! Thanks, Eileen. I do have multiple blogs, though Marmelade Gypsy is the only one I do regularly! Modern Creative Life is a joint venture among many writers and I am merely a contributor. 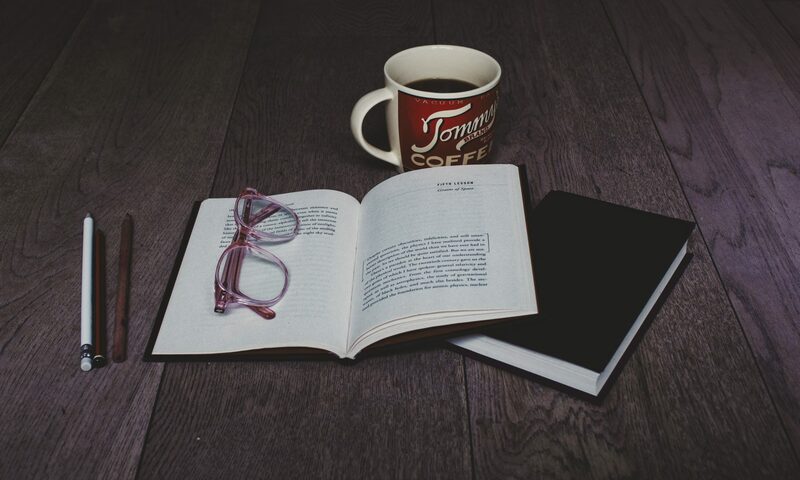 Come back on any given day and you will perhaps read a story, a poem, an essay, a thoughtful piece on creative living, see some wonderful photographs — you name it! Each “issue” (about two months) has a theme and this summer’s is refresh and renew, so most (but not all) the pieces will focus on that a bit! Check back to moderncreativelife often!